In today’s technologically driven world apps are a common place thing, and therefore it was simply a matter of time before pet specific apps were created and rose in popularity. 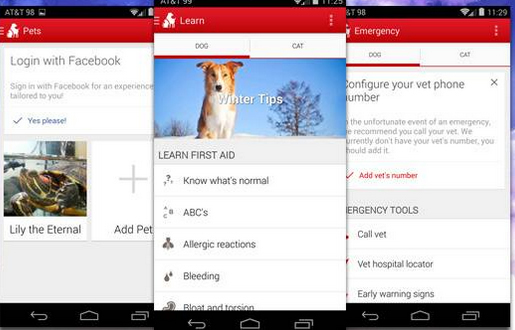 Although there are already a few pet first aid apps out there, the recently launched “Pet First Aid” app by the American Red Cross seems to be one of the better developed thus far. Costing a mere $0.99 this app provides iPhone and Android smartphone purchasers with a plethora of useful information for both canine and feline care. The “Pet First Aid” app provides information varying from an early warning sign checker for preventative care, to step by step instructions to guide pet owners through every day emergencies, to locating the nearest pet friendly hotels. This app is equipped with videos, interactive quizzes and step by step advice for almost any pet emergency situation – a must have for all pet owners out there! Prepare and protect your pet’s health with advice on administering medication, time to say goodbye, behavioral help and how to act in a disaster situation. Programmable veterinary contact number to be available when needed throughout the app. Learn first aid steps for over 25 common pet situations through a combination of text, video and images, in addition to identifying common toxic substances. Respond to pet emergencies with “how to” videos for the common and stressful emergency situations inclusive of size specific CPR techniques. Customize multiple pet profiles and set veterinary appointments.